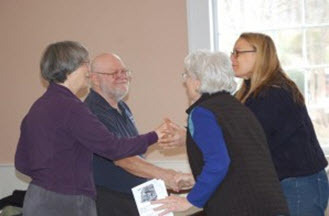 The Monterey United Church of Christ is a small church in a rural community in Berkshire County who thrives on being small. They have technically 12 members, but soon they will be taking in 11 more—virtually doubling their membership in one fell swoop. Despite its small size, Monterey has managed to make a big impact in people’s lives. It is an active congregation, and credits responsiveness and empowerment for its vitality. Clary had wanted to start religious education for her daughter when she turned five. When Clary learned about Godly Play through the church’s acquisition of a set of Godly Play materials, she approached Goodman and the two created Godly Play for Clary’s two daughters as well as the daughters of another local mom. Now Goodman replaces one sermon a month with Godly Play for everyone. So when someone felt empowered and showed up at church with a French horn and asked to play along with the hymns on Easter, the answer was a resounding yes. And when, a few years before, a musician showed up a bit under the weather and was unable to perform, the members responded by singing a cappella. So how does empowerment and responsiveness translate into doubling membership? Or were there other activities that brought new people in the door? Rev. Liz Goodman can be reached at the church office at 413-528-5850, or email liz@goodman.md.